Enjoy an evening of Shakespeare under the stars! 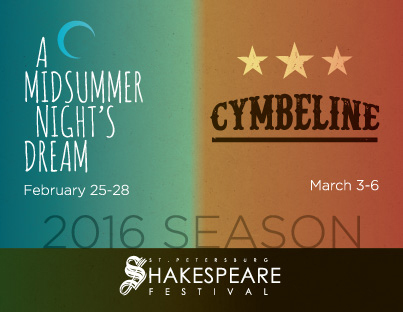 Bring your blanket or lawn chair and join USFSP students and local professional actors as they present Cymbeline - a tragic romcom first produced in the early 1600s - as part of St. Petersburg Shakespeare Festival's exciting 2016 season! Friday, March 4 & Saturday, March 5 - 7:30 p.m.
Sunday, March 6 - 4:00 p.m.